← Ankle Braces for Bud! A dog leash takes only moments to make and just two items, nylon webbing and a swivel hook. But you can customize them so you and your pooch stand out from the crowd with some fabric scraps very easily. Most dog leashes are either 4 foot or 6 foot long. For a 6 foot leash, you’ll need 7 feet of webbing, for a 4 foot leash, 5 feet. 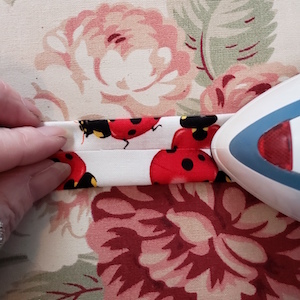 Simple simple simple, just insert the one end into the swivel hook, fold it over about 2” and sew it down, well, to make sure it is going to hold when your dog sees a squirrel or rolls around with another dog friend. 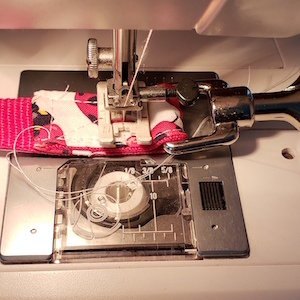 The swivel hook is thick so your presser foot won’t be able to get too close, so plan on stopping the stitches at least the width of the foot away from the edge. I like to sew a square and an X in the middle to make sure it’s not going to come apart. Fold over at the other end about 8” for the handle and sew that end as well. 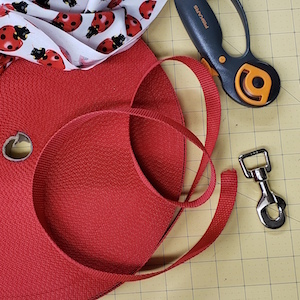 Customize your leash with fabric scraps! 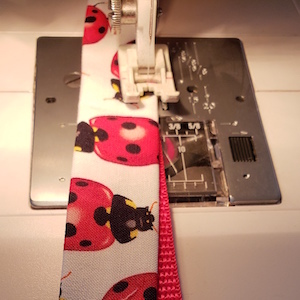 I’m using some scrap ladybug fabric I had. 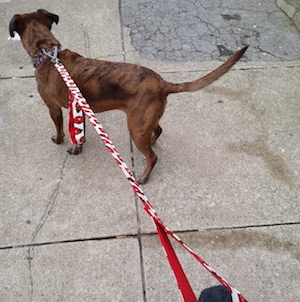 I cut strips 2” wide and sewed them together so it’s long enough for a 4’ leash. I needed 2 strips of 44” wide cotton to cover all of the webbing for one leash, so in cutting 2 strips I only used a 4” x 44″ of scrap of fabric. Fold the raw edges in and press them to have the finished piece 1” wide (the width of the webbing). Sew the fabric to the webbing leaving a little at each end to fold over the raw edge of the webbing. You can also just zig zag over the end of the webbing and fabric. We live in the city and not everyone wants my dog to approach them and beg for pets. 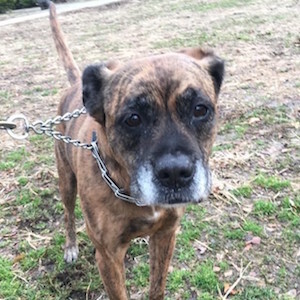 I always add a second handle on the leash so that I can keep her much closer to me when we walk past strangers. For the placement of the second handle you’ll have to figure out depending on the size of your dog and your height. My dog is medium height and I’m short, so I put the handle 15″ from the swivel hook. 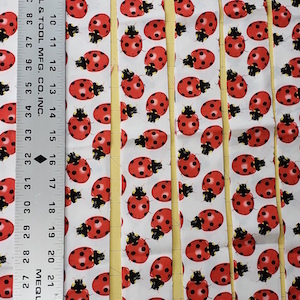 Hi Amy…just wondering what kind of webbing do I need to buy for this project? Width and thickness? great project, thank you! Nylon webbing is strong and great for leashes. It typically comes in 3/4″, 1″, and some a bit wider. I used 1″ because that is the size of the opening in the swivel hooks we carry. 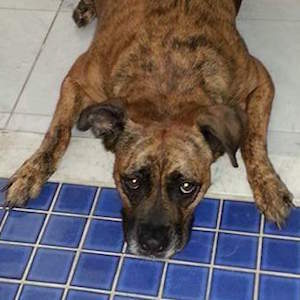 If you have a small dog you can use the 3/4″, but for a bigger dog the 1″ is perfect. Thanks for this awesome simple project. I’ll suggest it as a community project to my sewing group. Thanks so much for these directions! I can’t wait to try them.